New certification/partnership logos, advantageous changes and summer discounts! Handy Backup has completed the Microsoft’s Works with Windows Server 2008 certification! Now all users who work under Windows Server 2008 are guaranteed to have great experience when using our software. 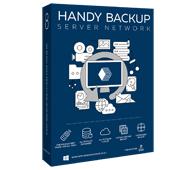 The new logo verifies that Handy Backup and Handy Backup Server Network are fully compatible with the platform and will work reliably and error free under any system conditions. More about Server 2008 Backup Software. Download our software and back up your workstations to FTP or other media - free 30 days trial! The certification for the “Works with Windows Server 2008” logo allowed our company to become Microsoft Gold Certified Partners. Gold Certified Partners represent the highest level of competence and expertise with Microsoft technologies, and we are proud to have reached this level! The latest large enhancement of Handy Backup, Oracle Backup plug-in, coupled with overall high quality of the application allowed our company to become Oracle Partners. We hope that enterprises that exploit Oracle technologies will find Handy Backup greatly useful and beneficial for their businesses! And the last, but not least we have extended functionality of Handy Backup Standard with the backup to DVD feature and functionality of Handy Backup Professional with the Database Backup feature. Now you get the more for the same price!